Changes any gringos to Mexicanas in a flash! 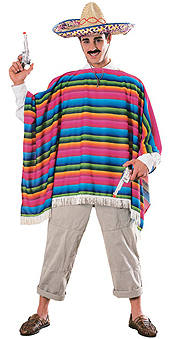 Hola Amigo, this here is a one of a kind Mexican Serape Costume. With a Sombrero hat, colourful rainbow striped poncho and a fringed edge for extra detail, all you need is some spicy food and good tunes and you're ready to party. So invite your friends over and have an amazing time in this Mexican Serape Costume.